I grew up watching the movie School of Rock, falling in love with Jack Black’s performance and belting out every song. Being such a huge fan, I went to the final Melbourne performance of Andrew Lloyd Weber’s musical version on Sunday night with high hopes. The musical, held in beautiful Her Majesty’s Theatre, brought the house down with its mix of original and new songs, amazing performance by the actors and amazing instrument playing by the young people playing the Horace Green students (I was shocked to learn that they all played their own instruments too, with no synching. Very talented indeed!). The story remained the same – a down-on-his-luck rock star creates a fake persona as a substitute teacher to pay the rent. At Horace Green Preparatory, “Mr Schneebly” discovers that the students in his class are extremely talented musicians and decides to use them to try and win the upcoming Battle of the Bands. Along the way, he teaches them important lessons about being who you are, standing up for yourself, that music can bring out the best in people and, most importantly, to stick it to the man! Dewey Finn, the “teacher” who brings the kids together and teaches them these valuable lessons, was played in this performance by understudy Joe Kosky, who proved to be every bit as talented as main actor Brent Hill. The star of the show was, without a doubt, School of Rock lead guitarist Zack Mooneyham, played in this extravaganza by Ben Swissa. Ben rocked the role, all the while shredding impressive guitar solos with a guitar bigger than his whole body. The new songs included Dewey’s dreams of stardom in When I Climb to the Top of Mount Rock, rebellious rock anthem Stick It To The Man and the kids’ passionate cry for their parents to understand them in If Only You Would Listen. The whole theatre, including yours truly, was belting out the main song, School of Rock (Teacher’s Pet), clapping along to the beat and cheering on this talented bunch. If this performance was anything to go by, then the Sydney and Brisbane will soon be rocking on as well. 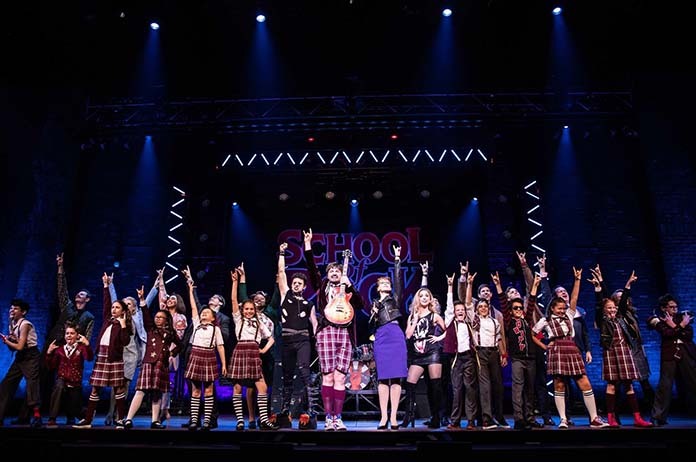 Did you see the Melbourne performance of School of Rock The Musical? Will you be seeing it in Sydney or Brisbane? Let us know in the comment section below.